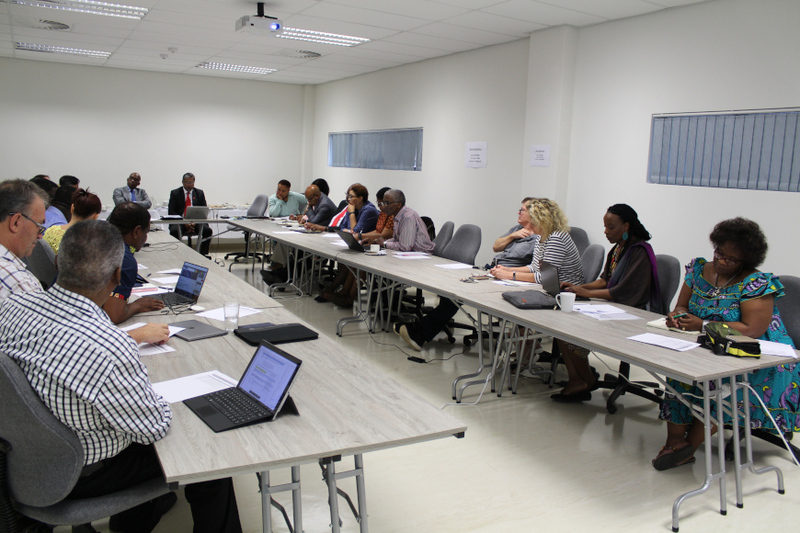 The Durban University of Technology (DUT) Executive Management met with members of the National Research Foundation (NRF) – Research and Innovation Support and Advancement (RISA) Executive Committee on Thursday, 24 January 2019 at DUT’s Steve Biko Campus in Durban. NRF – RISA was hosting their Executive Committee meeting at DUT as part of their national roadshow to visit various institutions of higher education around the country. Prior to their meeting with the DUT Executive Management, members of the RISA Executive Committee were taken through a tour of the state-of-the-art facilities of the award winning and internationally recognised Institute for Water and Wastewater Technology (IWWT) located at the Steve Biko Campus. During the engagement between NRF – RISA and DUT Executive Management, Deputy Vice-Chancellor: Research, Innovation and Engagement, Professor Sibusiso Moyo, on behalf of DUT expressed appreciation to NRF-RISA Executive Committee for deciding to host their Executive Committee meeting at DUT. “This is the first time we are hosting the NRF-RISA Executive Committee meeting here at DUT, and we are grateful that you chose DUT,” she said. Vice-Chancellor and Principal, Professor Thandwa Mthembu gave an overview of the strategic direction that is currently undertaken by DUT in terms of its research and innovation approach. “Research and innovation in a University is very important, and we really believe that through partnerships that we establish internationally and otherwise – we would like to make an impact in our local and regional boundaries. So essentially, those partnerships should be seen as a way of exploiting the international and national environment for the purposes of making an impact within our locality,” he said. “We need to be working hard to see how our research focus areas talk to the needs of our local and regional environment first and foremost. It is not as if we are not interested in being internationally recognised, but we believe that through engaging with our local and regional boundaries and perhaps national landscape in terms of research and innovation, we could eventually be recognised as leaders. The countries that seem to lead in certain areas, are leading because certain regions / localities started to do something remarkable in their own thus contributing towards making the country great in that area,” Prof Mthembu added. Prof Mthembu also highlighted that because of the University’s historic background, where there was no serious focus in research and innovation and considering the current vision – DUT required a lot of support in order to achieve the current vision. “We need to have support at different levels, we need support in terms of shaping our research focus areas, we need support in terms of our top researchers and academics who require funding to pursue their passion. Younger researchers also need support and we need support in terms of our staff ratio with PhDs, which is currently relatively low. We understand that this is not going to be easy to achieve, but we need to provide more space for our staff to be engaged in research and innovation. Our students of course need a lot of support from NRF, so I’m really happy that you are here as RISA to get to understand the real issues we face here at DUT through the engagement that you are going to have,” Prof Mthembu elaborated. NRF Deputy Chief Executive Officer: RISA, Dr Dorsamy (Gansen) Pillay said essentially the purpose of this engagement with DUT is to find common good between DUT and NRF, which will benefit the country. Adding that they also want to establish shared engagement between DUT and NRF. “We decided that we are going to take our meetings out to the people, to interface so that universities are better informed in the way we would like to partner with them. We made a conscious decision that we would focus on the Universities of Technology (UoTs) because we feel that they are somehow neglected,” he said. Pictured: Members of the DUT Executive Management meeting with members of the NRF-RISA Executive Committee.